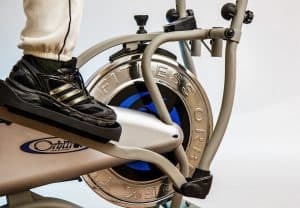 People who want to lose weight don’t have to do cardio everyday, but they should know that a specific amount of exercise is required to lose weight. 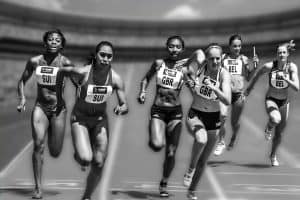 Scholastic, collegiate, or post-collegiate athletes—competing in aerobic-based sports—should do cardio everyday. People doing cardio for health benefits don’t have to do cardio everyday, but they should know that a specific amount of exercise is required to get health benefits. Overweight people, who are stuck at some weight but who want to do cardio to lose weight, should aim to burn 26 calories per kilogram per week. An overweight woman that weighs 200 pounds, for example, should aim to burn around 2400 (2359) calories by way of cardio (or some other exercise). This is the amount to burn over and beyond the calories she would normally burn. If she walks to work, or goes to the gym 3 times per week, or takes a spin class, etc, she has to keep doing that. Then she has to add cardio on top of that. Let’s say the elliptical machine is her preferred form of cardio, and that she burns about 500 calories during a 45-minute session. How many days a week should she do cardio? About 5 will get her there. So, weight-losers don’t have to do cardio everyday. They have to do enough cardio to trigger weight loss, and they can vary the number of days as fits their schedule. Competition is tough. A sporting contest brings together people with different natural gifts, different levels of conditioning, and different degrees of coaching. You get no sympathy for having to compete against a bigger, stronger, or faster competitor. You enter a contest as ready as you can be, and you perform the best that you can. That’s not to say that serious athletes are apathetic competitors. Very, very, few serious athletes enter competitions to participate only. Many want to win, and the rest want to at least perform well. To be ready for serious competition, generally speaking, requires constant practice. Serious athletes practice daily, and if not that, they practice just about every day. That’s how they raise their capacity to compete at high levels. In peak form, when I was a competitive runner, I would warm-up running 6:30 minute-per-mile pace, and that speed felt effortless. I had to do cardio every day to achieve that level of fitness. There are risks that go along with training every day. But it’s a risk that serious athletes usually have to accept. These people don’t have to do cardio every day. They should instead focus on getting a certain amount of exercise per week. What’s the amount? It depends on the intensity of the cardio exercise. Let’s say that there are three different exercise intensities: light, moderate, and vigorous. In this scheme, a light level of intensity would feel fairly light, so light that you could sing, even while doing cardio. A moderate level of intensity would feel somewhat hard, meaning that you could talk if you had to, but rather not while doing cardio. A vigorous level intensity would feel hard, maybe very hard; that’s when you huffing and puffing when doing cardio. If your cardio is light, you should do 300 minutes of it per week. If your cardio is moderate, you should do 150 minutes of it per week. If your cardio is vigorous, you can do as little as 75 minutes of it per week. You decide if those minutes get spread out over 7 days or if they are done in some other way that your schedule accommodates.